This review of Glynn Young’s Poetry at Work was originally published by the Englewood Review of Books. This book, the first of T.S. Poetry Press’s Masters in Fine Living series, is intended to be read slowly and reflectively. Poetry at Work consists of 20 short, practically poetic chapters, each offering a few pages of thoughts about a specific area of work, along with a poetic exercise and, in many chapters, a few lines of Young’s own poetry about his work. The chapters largely deal with Young’s own experiences with turning to poetry for encouragement, inspiration, and comfort during his career in speechwriting, public relations, and social media. He wants readers to share his discovery that poetry can be used to discover beauty and purpose in the everyday. Rather than seeing poets as outsiders speaking into the corporate world I believe, that poetry already exists within business and work. Though they may be largely ignored and unrecognized, I’ve seen poets and poetry within the business world — insiders if you will or vital to the ongoing operation and success of what we call work. They just need to be given the freedom to do what they do best: help navigate uncharted territory and speak with poetic precision to lead the way. It took me several chapters (which wasn’t long; Young is an efficient writer) to catch on the purpose of his project. This wasn’t a book about poetry, per se, at least not in the way that I expected. 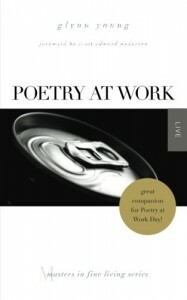 While the first few chapters feature famous “working poets,” such as the physician William Carlos Williams, the insurance executive Wallace Stevens, and ad man Dana Gioia, and there are a number of fine poems about the topic of work throughout the book, Young is less concerned with the study and craft of poetry than with using the tools and habits of poetry to inform our life at work. Young wants his readers to think poetically about their work and to write poetry as a way of understanding and processing their work. The vignettes about poets and their jobs stop early in the book, but every chapter includes a poetic exercise, encouraging the reader to reflect on a particular aspect of work and write about it: the commute, the office, the boss, layoffs, retirement. Young finds poetry in unexpected places. A few of his chapters are titled “The Poetry of Vision Statements,” “The Poetry of the Organization Chart,” and even, God help us, “The Poetry of PowerPoint.” Just as I was wondering whether Young was taking this gimmick too far, “The Poetry of Unemployment” and “The Poet Blogs the Layoff” brought out moments of real depth from the theme. Not every chapter paid off so well, though; in “The Poetry of the Vision Statement,” for example, Young might have been pushing to discover poetry that simply wasn’t there. Some of the best moments of the book came when Young reflected on the value of poetry in his own life and connects specific moments with poems and poetic themes. In the chapter on unemployment, Young introduces us Richard Cole’s terrific “October Layoffs” (available online at Cole’s website). I would have enjoyed more moments like these, and I could easily see a companion volume — Poetry of Work, perhaps? — collecting poems about work. Poetry at Work would be a good resource for someone who wants to begin writing poetry or incorporate poetic reflection in his daily routine, or who would like a different take to the practice of journaling. More experienced students of poetry may wish that Glynn Young had gone into more depth in his explorations of poetry and the lives of poets, but they will recognize in Young their own love of the art. Nice review of a very interesting application and view of poetry! I see it as a great resource for heads of HR, job counselors and for employers to share with employees. Who am I? Someone who delights in incorporating poetic reflection to my daily routine. Thank you for sharing your review!